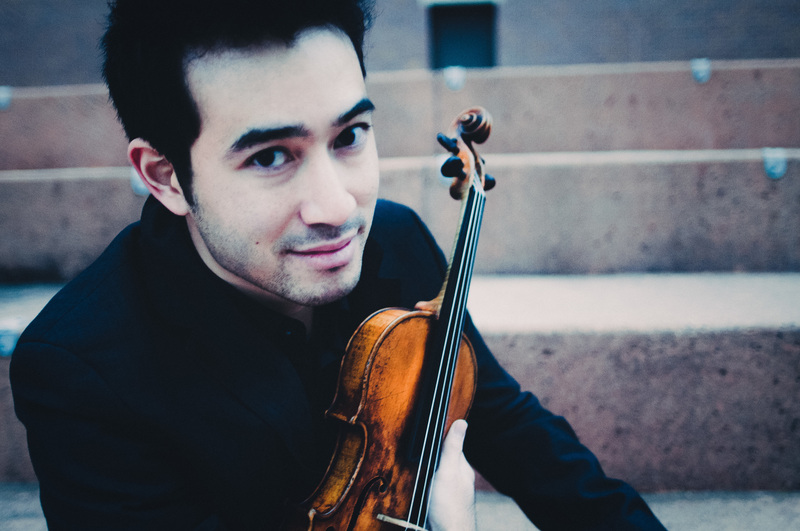 Violinist Suliman Tekalli, an alum who was 12 years old when he appeared on From the Top with Host Christopher O’Riley on Show 22, is now a 28-year-old prolific performer and composer who is involved in several important areas of the classical world. We caught up with him to hear about his musical adventures. What do you remember about your time on From the Top? The whole thing was so much fun. Only now do I see how cleverly the show was put together. I enjoyed working with Christopher O’Riley and I loved speaking with violinist Mark O’Connor. His way of playing and composing stuck with me. I knew that he was the kind of musician and artist I wanted to be. I look back on that show as being one of my formative experiences. For example, it was one of the first times I got to see a high caliber string quartet perform. Our family listened to From the Top often, so it was exciting to be on the show myself – my first national public radio exposure! I earned my Bachelor of Music Degree in violin performance from the Schwob School of Music at Columbus State University in Columbus, Georgie where I studied with Sergiu Schwartz. I went on to study at the Cleveland Institute of Music (CIM) and earned my master’s degree in violin performance while studying with Joel Smirnoff. Finally, I was fortunate to attend Yale University School of Music for my artist’s diploma on a full scholarship. What were some of your formative musical experiences? I graduated from high school at age 17 and studied for a year at Juilliard’s Pre-College program. During that year I stopped playing briefly which was a soul searching time for me. I needed to truly understand why I was making music. What were my primary motivations? Were they sincere? I needed to make sure that I couldn’t live without music and without being a violinist. After about three months I realized I had to get back to it. Being at Juilliard opened my eyes to larger possibilities. One of my suitemates in the dorm was Jon Batiste who is now the successful leader of the group Stay Human (The group has performed at the From the Top Gala and is now the house band on the Late Show with Stephen Colbert). He would often join me in one of the practice rooms. Though I primarily played the violin, I often explored the piano as well. When Jon came in I would immediately relinquish the piano stool to him. I observed him letting his ideas flow and then grappling with disciplining his own creativity. So it was this jazz pianist bursting with personality who so positively influenced my creativity with classical music. As an undergraduate, I started The Tekalli Duo with my sister Jamila who is three years older and an outstanding pianist. During this time I began to write and transcribe pieces that Jamila had introduced me to – works that really made a big impression on me – in order to be able to play them with her. For example, I transcribed Ravel’s Le Tombeau de Couperin. I did the research and found that it had not been transcribed before (hear it in the video below). I’ve also transcribed the Tchaikovsky Nutcracker for violin and piano and performed excerpts of it in competition. People advised me not to do that – “too risky!” they warned. I love the standard repertoire, but my urge to play my own work and contribute creatively goes back to what both Batiste and Mark O’Connor told me: that I should not be afraid to continue the tradition of the performer/composer. Now I am working on the copyrights and hoping to publish my transcriptions soon. Another fantastic experience was when I won the top prize at the 2015 Seoul International Music Competition! As a result, I received numerous performance opportunities, including performing as a soloist in Washington, D.C. for South Korean President Park Geun-hye who was visiting with President Obama. I performed Vivaldi’s “Summer” with the world-renowned Sejong Soloists who also debuted my arrangement of Ástor Piazzolla’s Libertango with violist Richard O’Neill. Secretary of State John Kerry congratulated me himself! Performing for an audience of world leaders was a singular rush and a great honor. In addition to performing with my sister, I teach at the Strings Performance Academy in Chicago and perform with the Catalyst Quartet. I’ve actually had the privilege of working with other From the Top alums such as Brannon Cho and Zenas Hsu.